Napoleon and Ageod should go together like milk and cookies. Who but a French wargaming Company should get a Napoleonic game right? 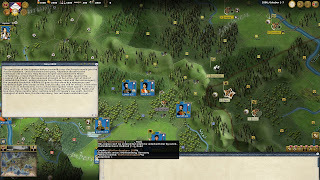 Ageod has entered the fray again with The Wars of Napoleon. Their other fine games include Revolution Under Siege, Alea Jacta Est and Rise of Prussia, to name just a few. 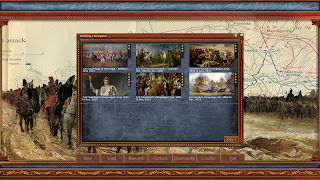 They have also produced the game Napoleon's Campaigns. 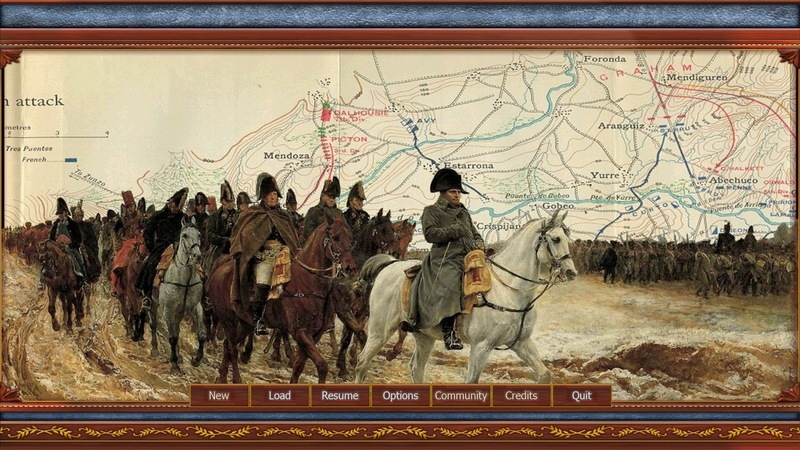 Napoleon's Campaigns was never received with the enthusiasm of most of their other games. It almost seemed like Ageod's red haired stepchild on their forums and other places. It just never seemed to fit in. Let's look at their new Napoleonic game, which was just released on Steam, and see if it is a child of love or an also ran. May I suggest a run to YouTube, to listen to Edith Piaf sing " La Marseillaise ". If the Sparrow's rendition doesn't get you into the mood to conquer Europe, nothing will. With all of the Ageod games you have to invest the time to actually learn the system. Fortunately, once you have learned it with one of their AGE ( Athena game engine ) engine games, you should be all set to play the entire series. There are a few excellent YouTube videos on how to play. Let me state that the Ageod/Matrix/Slitherine group is one of the few on the web where you can get actual answers to your posts and questions almost immediately, and more than that, sometimes answered by the management. Their professionalism and caring show with the answers you will receive. Not too long ago, I bought an older game from the group, a 2008 game to be exact, that is still being patched and worked on. I received help promptly in trying to run the game. The maps are the standard Ageod eye candy. The map is absolutely huge, from Great Britain to the Persian gulf, and the Urals to Morocco. Their are tons of insets for the Americas and Asia. Fortunately, you have a mini map for quick movement. 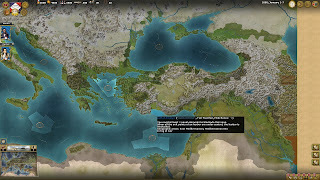 You can play seven nations in the larger scenarios. These are Great Britain, France,Spain, Russia, Prussia, Austria, and the Ottomans. There are numerous ways to get the information you need, sometimes just by hovering the mouse, or clicking on the myriad of tool tips to help the budding conqueror within you. There are six campaigns you can choose, with the first Waterloo used as a tutorial. The complexity of the campaigns is graded on a one to five scale with five being the hardest. The Last flight of the eagle scenario (Waterloo) is a 2/5 on the scale. The two Napoleon's campaigns scenarios are the hardest, listed as a 5/5. These campaigns add the complexity of production, policies, and diplomacy. 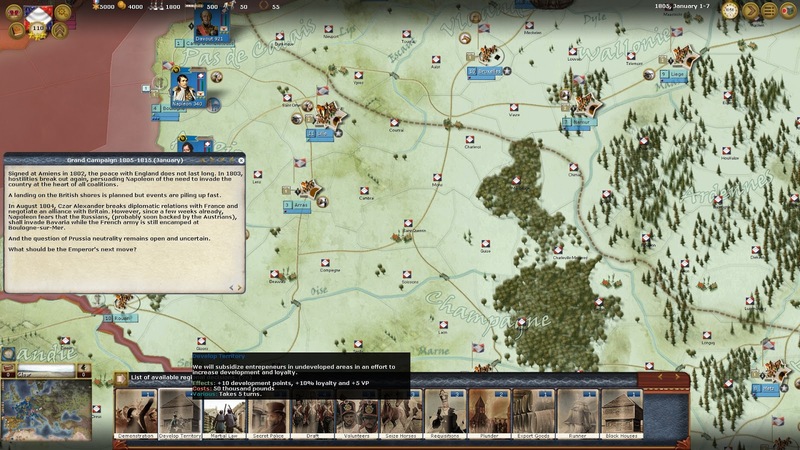 This is a screenshot of the start of the 1806-1807 Prussian campaign. This is includes the part of the campaign where you will have to fight the Russians. 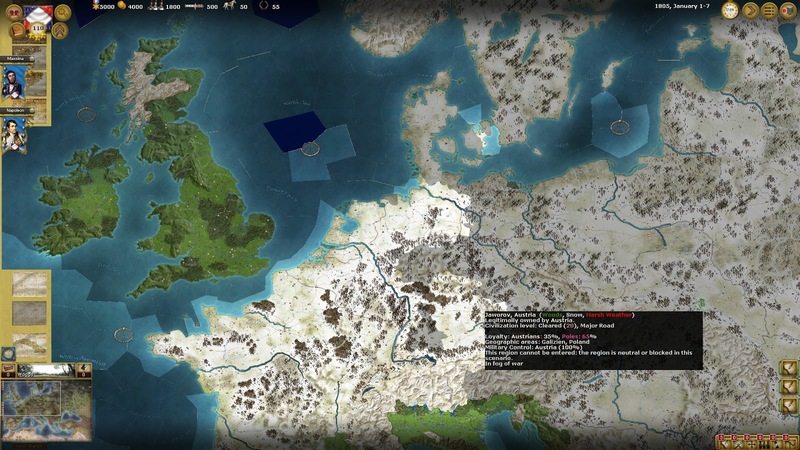 So you not only get a chance to re-fight Jena, but also Eylau, and Friedland. Just to be clear, you are fighting the whole campaign, not just the separate battles. 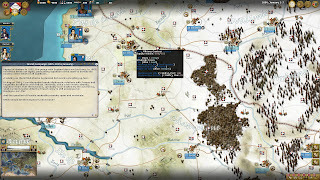 Even the Waterloo scenario is the whole campaign in Belgium. 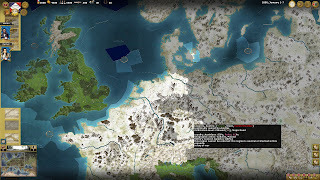 Movement takes place through various regions, like all of Ageod's AGE engine games. The units are division, corps and armee (army), with attached artillery, engineers and your trains. Your units of movement will mostly be corps, separating to be able to forage etc. and combining at or right before a battlefield. Blue lines will show your intended moves. Units will also have "posture" as in aggressive or defensive with varied amounts of each. It is simultaneous movement with a seven day time span for turns. Your units deal with a "command cost" and "command points" system. The units' orders cost "X" amount of command points and their leader has only a certain amount of points to be able to move and fight etc.. Some units also have special abilities. 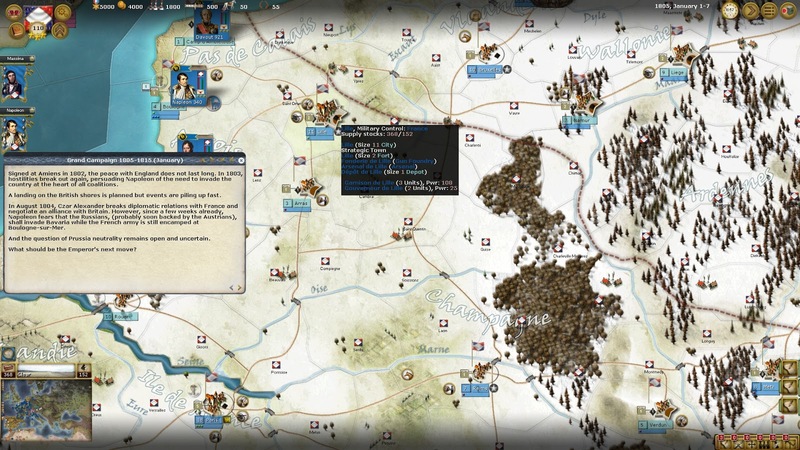 Playing as the French, you have an edge in the beginning of the longer scenarios because of your leaders' command points and overall ability. As the years progress, the other nations leaders will reflect their growing capability and learning of how to deal with the new tactics and strategies of Napoleonic warfare. The key to victory is in your national morale compared to your enemies. Victory points are won or lost by the capture or loss of cities and the destruction of enemy formations. Pretty standard fare for a wargame of this type. In the longer scenarios you also have to deal with your nation's diplomacy, economy, and other regional decisions. These, while not as deep as some of the other nation building simulations available, are a welcome touch for a game of such breadth. If you so choose, you can put Europe of 1805 into more of a sandbox mode. You can opt to have randomized leaders, fog of war, and even increase the force pools. Some of these can change the entire game and make it non-historical. Players might enjoy playing by rewriting history, and others would like to follow it more closely. I am among the latter. I would like to see a DLC with more campaigns, i.e. Russia in 1812, Spain by itself, or the 1813 German campaign. A well done 1813 campaign is on my bucket list. There had been earlier reports of CTDs while playing. They seem to have been cleared up with the latest patches. I did not experience any. AI turn speed is fine for a game as complex as this one. So, how does this stack up compared to its predecessor? I believe His Imperial majesty would be pleased, and it fits nicely in the pantheon of other great wargames from Ageod. If you are in the mood to march to Moscow and see your army destroyed by typhus, by all means, go for it. Is the map, like in the previous games, slow to scroll on ? I remember how painful it was to scroll it and the only way to make it better was to remove the border line on a ini file somewhere in the game folder. Wow, talk about sugar coating a bad product! Not one mention of all the crashes, weird AI formations, AI over production of artillery units, supply issues in minor nations, etc... This is by far the worst AGEOD game in years, maybe a decade! I timed scrolling from one side to the other an it took eighteen seconds, but it is a huge map.